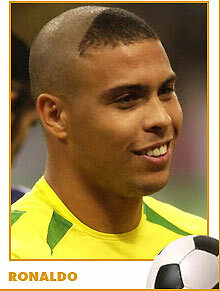 RIO DE JANEIRO -- With his invention of his 2002 World Cup winning haircut, Ronaldo topped the worst-ever haircut voting in the world of soccer. Beating out some of the outrageous styles of David Beckham and the fern-like afro of Carlos Valderrama, Ronaldo took first place on the list of bad haircuts, English newspaper the Sun reported. The haircut, which featured a completely shaved head, except for a thin patch over his forehead, was apparently used in homage of the Brazilian equivalent of Charley Brown. Ronaldo is undoubtedly considered to be one of the best forwards and is currently the leading scorer in the history of the World Cup. But in 2002, it was not his goals that caught the attention of the world but his exuberant hair style that had the whole world buzzing. Even before walking away from the game, with this latest honor Ronaldo is guaranteed his spot in the history books of soccer.